Firmware 2.00 contains numerous improvements that affect autofocus performance, the electronic shutter, ease of use and power management. It also offers a new flash system. One of the important improvements of firmware 2.00 is arguably the new autofocus system that brings most of the X-T2’s features and performance ability to the X-Pro2. The most visible difference from the previous firmware version is the expansion of the focus area to 91 (7 x 13) or 325 (13 x 25) focus frame positions. The newly added focus frames add coverage to the left and right edges of the live view image. Since they reside outside of the sensor’s central PDAF area, they are CDAF-only. The expanded focus area is beneficial to all focus modes: Single-Point AF, Zone AF, Wide/Tracking-AF and manual focus (MF). The new focus frames aren’t just available in the electronic viewfinder (EVF) and on the LCD monitor, but also in the optical viewfinder (OVF). This was made possible with improvements to the automatic parallax correction. It now allows focussing with the OVF at the minimal focus distance (MFD) of any lens, even if that is below the former 50 cm limit. In such cases, the green AF confirmation frame will be clearly offset to the lower right, indicating the actual focus position.The OVF bright frame is shifted accordingly. Another change affects the display of the camera’s optional AF correction frame (AF/MF SETTING> CORRECTED AF FRAME > ON). Until now, the dotted corrected AF frame was always calibrated to a distance of approximately 50 cm. With firmware 2.00, this distance can be longer if the MFD of the attached lens exceeds 50 cm. In such cases, the corrected AF frame now represents the actual MFD of the lens. Please consult tips 38 and 39 in The Fujifilm X-Pro2: 115 X-Pert Tips to read more on working with the OVF and parallax correction. Don’t forget that the improved parallax correction also requires you to update the firmware of several lenses. Beyond that, firmware version 1.12 for the XF16-55mmF2.8 R LM WR zoom lens also offers better compensation for chromatic aberrations (CAs), which sometimes plagued this lens when it was used stopped-down in its wide-angle position. You can learn more about chromatic aberrations and digital lens corrections in tips 18 and 94 of The Fujifilm X-Pro2: 115 X-Pert Tips. Firmware 2.00 improves overall AF performance. The precision of the phase detection autofocus (PDAF) has been enhanced, and the faster PDAF is now used roughly twice as often as before. This means that the camera less frequently falls back to the slower contrast detection autofocus (CDAF). This is particularly beneficial with slow focusing lenses. Another improvement affects subject tracking in AF-C mode, especially in concert with CL, the slower of the two burst mode settings. In this configuration, the X-Pro2 offers a real-time live view image between consecutive shots, and it can track moving subjects not only with the faster PDAF, but also with the slower CDAF. Until now, CDAF / AF-C subject tracking suffered from a handicap: visible (and time-consuming) „pumping“ which was caused by the CDAF’s continuous efforts to lock on the subject. This irritating effect has been mitigated with firmware 2.00, which also improves the camera’s CDAF tracking performance. The improved AF system was basically copied from the X-T2. It uses the faster PDAF more frequently, and it also has a positive effect on the X-Pro2’s CDAF tracking performance. A practical example for this is „intelligent“ 3D tracking, which is based on pattern recognition and can follow (track) a moving subject even when it’s moving to the edges of the frame. See tip 81 for more information on how to use 3D tracking. There’s a change in how auto exposure (AE) modes work in concert with the AF-C mode: With firmware 2.00, the exposure isn’t locked when AF-C is selected and the shutter is pressed halfway. Instead, the exposure is permanently adjusted until the very moment that a shot is actually taken. This affects the three „classic“ exposure modes (A, S, and P) as well as the camera’s „misomatic“ mode, which is detailed in tip 54. To suppress the new continuous exposure metering in AF-C mode, you can lock the exposure using the AE-L button before you take a shot. After locking the exposure, you can still adjust it with the camera’s exposure compensation dial. To accomplish this without crazy finger acrobatics, make sure that SET UP > BUTTON/DIAL SETTING > AE/AF LOCK MODE is set to AE&AF ON/OFF SWITCH. As soon as you lock the exposure with AE-L, the locked exposure parameters (aperture, shutter speed, ISO and DR settings) are displayed in the live view. AF-C has also been improved in concert with CH mode (fast 8 fps bursts) and 3D tracking (AF mode Wide/Tracking). With this combination of settings, only the PDAF-enabled sensor area—which covers approximately 40% of the image area—is available for 3D subject tracking. 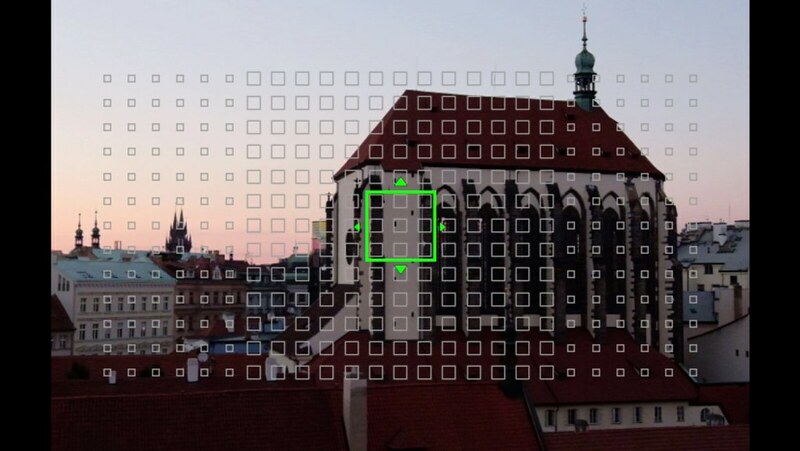 Firmware 2.00 offers pattern recognition based subject tracking in this area at 8 fps. You can learn more about the X-Pro2’s different autofocus modes in chapter 2.4 of The Fujifilm X-Pro2: 115 X-Pert Tips. Another autofocus improvement affects the camera’s eye-recognition AF option. In its AUTO setting, the X-Pro2 now automatically picks the eye that’s closer to the camera. This is a somewhat strange improvement, because that’s how AUTO mode was supposed to work all along. The electronic shutter (ES) has been improved. It now supports AF-C tracking in burst mode (CL and CH). This sounds great, but don’t expect the electronic shutter’s AF tracking performance to match that of the mechanical shutter. In other words, keep using the mechanical shutter whenever it is possible. Please don’t forget the other known drawbacks of the ES: there’s the rolling shutter effect, and a tendency for striped image results when you are using the ES in concert with pulsed light sources. And you still can’t fire a flash with the ES. On the bright side, the optical image stabilizer (OIS) in XF and XC zoom lenses now works better better when the electronic shutter is used, but it still isn’t as reliable as it is when the mechanical shutter is selected. 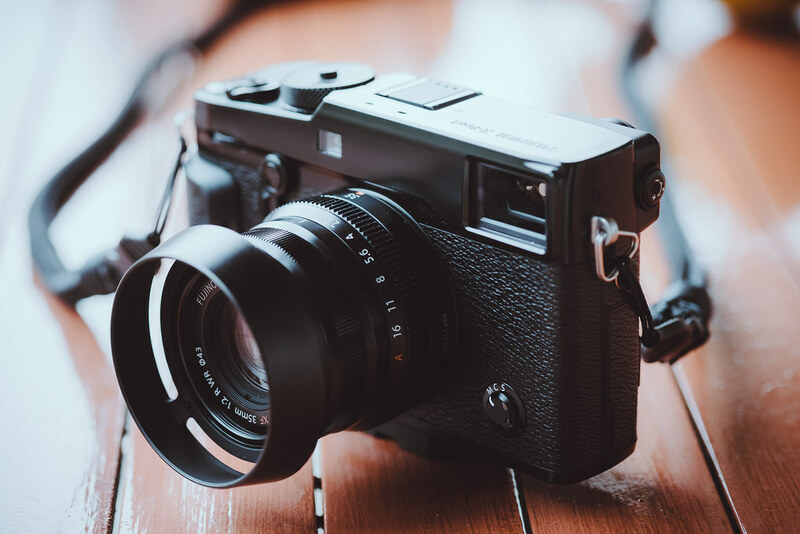 To learn more about the electronic shutter, please read tip 63 in The Fujifilm X-Pro2: 115 X-Pert Tips. By the way: The slower of the two burst modes (CL with 3 fps) now allows taking one single shot with a quick press of the shutter button, but only in AF-C mode. In all other configurations, burst mode will still record at least two frames in a row (unless you use very slow shutter speeds). Firmware 2.00 brings the updated flash system of the X-T2 to the X-Pro2. Fujifilm’s legacy flash guns (EF-X8, EF-20, EF-X20, EF-42) remain compatible with the new system and can be used like before. However, many Fuji TTL-compatible third-party flashguns don’t work with the new system and may require a firmware update. If this affects your Fuji-compatible TTL flash, contact the regional distribution office of your flash manufacturer and discuss update modalities. There’s also a chance that Fujifilm will provide another update to the camera firmware to restore compatibility with third-party flashguns. 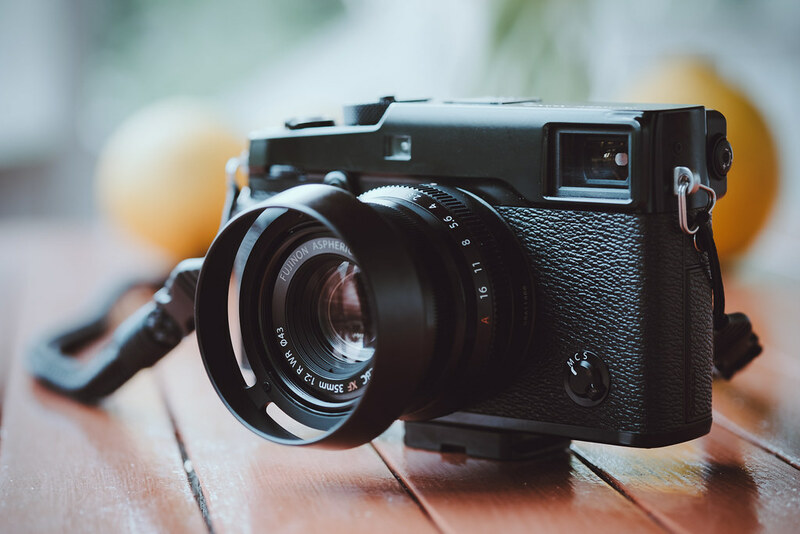 For example, Fuji’s firmware 1.10 for the X-T2 and firmware 5.00 for the X-T1 restore compatibility with the Nissin i40 (and possibly other third-party models). The Fujifilm-compatible version of the popular Nissin i40 requires an update to work in concert with the X-Pro2 and firmware 2.00. However, it works with the X-T2’s new firmware 1.10 and firmware 5.00 on the X-T1. In any case, the i40’s popular “unofficial” manual HSS function (see tip 103) is lost with Fujifilm’s new flash system. 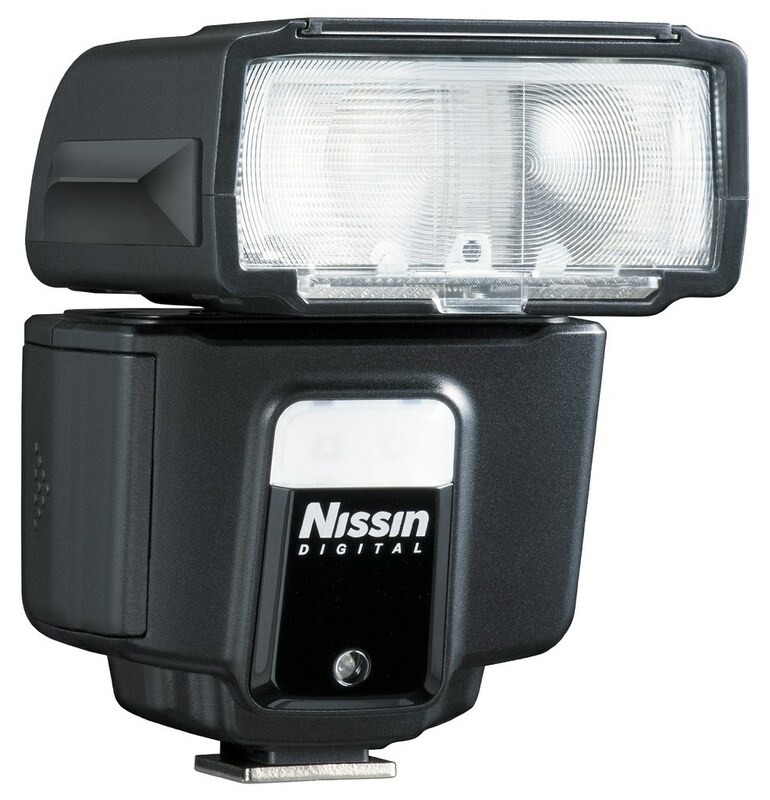 In order to gain full HSS compatibility, Nissin will have to provide a firmware update for this and other of their flash devices. Fujfilm’s new flash system offers many new functions, such as wireless TTL control of up to three different flash groups, stroboscope flash (up to 100 emissions with up to 500 Hz), high-speed sync (HSS) up to 1/8000s, and the opportunity to control almost all flash functions in the camera menu so you don’t have to touch the flashgun to change settings. In order to use of these new functions, you need Fuji’s new EF-X500 flash, which (after several delays) is supposed to be available in November 2016. If you aren’t deterred by the high price and the old-fashioned light-based communication protocol of this flash unit, you might like the EF-X500. 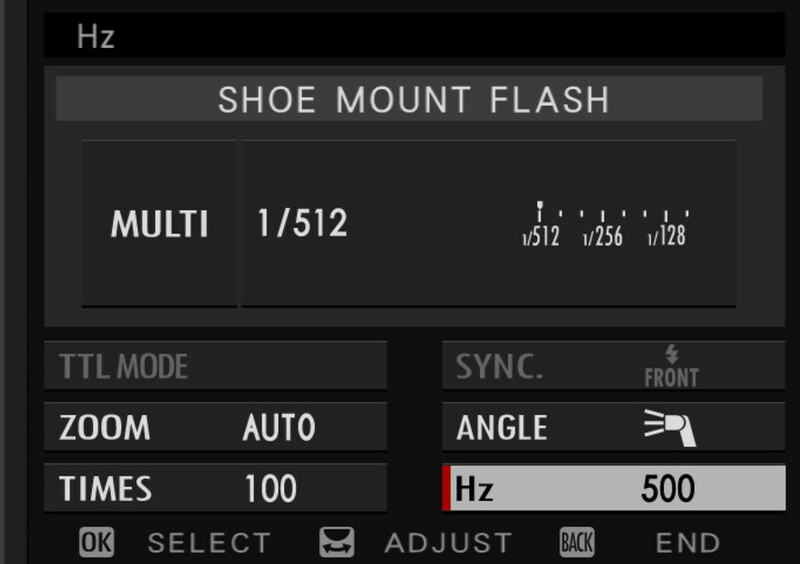 It’s the most capable shoe-mount flash from Fujifilm, and the only one that fully supports all functions of firmware 2.00’s new flash system. I expect third-party flash units to fully support the new flash system in the future. Until then, you can always manually trigger third-party flash guns via the middle contact or the camera’s sync port. The tiny EF-X8 flash that’s included with the X-T1 and X-T2 doesn’t require its own batteries, and it also works on the X-Pro2, from which it receives power through a special contact. Firmware 2.00 even provides new functionality for the EF-X8: You now have manual control over the light output, and you can sync it to the rear shutter curtain in manual mode. Previously, this was only available in TTL mode. The small EF-X8 has no buttons or switches and is fully controlled by the camera. 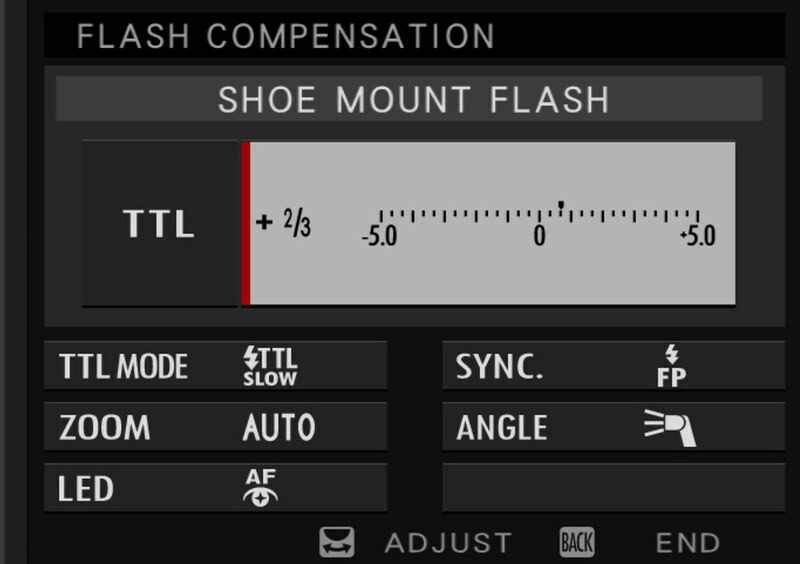 The new flash control page of firmware 2.00 offers elements for flash mode (TTL, Manual, Commander, Off), flash exposure compensation (± 2 EV in 1/3 EV steps), TTL mode (normal sync, slow sync, and auto flash in exposure mode P), as well as syncing on the front or rear shutter curtain. The X-Pro2 recognizes the EF-X8 as its supplied flash, which is ironic since Fujifilm does not include it with the X-Pro2 (only the X-T1 and X-T2), so you actually have to buy the “supplied” flash separately. A welcome addition of firmware 2.00 is the opportunity to manually control the tiny EF-X8 directly from the camera. You can control the light emission in full EV stops from 1/1 (max. power) down to 1/64. 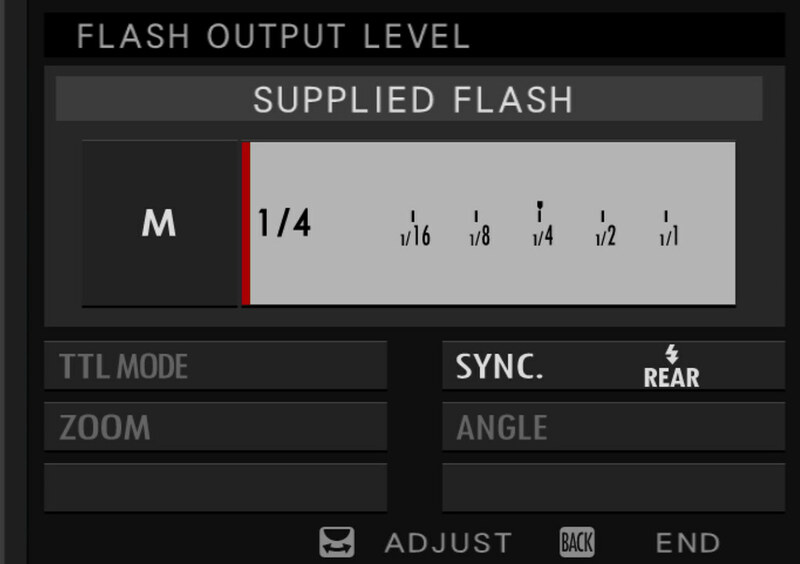 Additionally, it’s now possible to manually synchronize the flash to the rear shutter curtain. Previously, this option was only available in TTL mode. Synchronizing to the rear shutter curtain in manual flash mode also works with other legacy Fuji flashguns, like the EF-20, EF-X20, and EF-42, as well as manually triggered third-party flash devices. 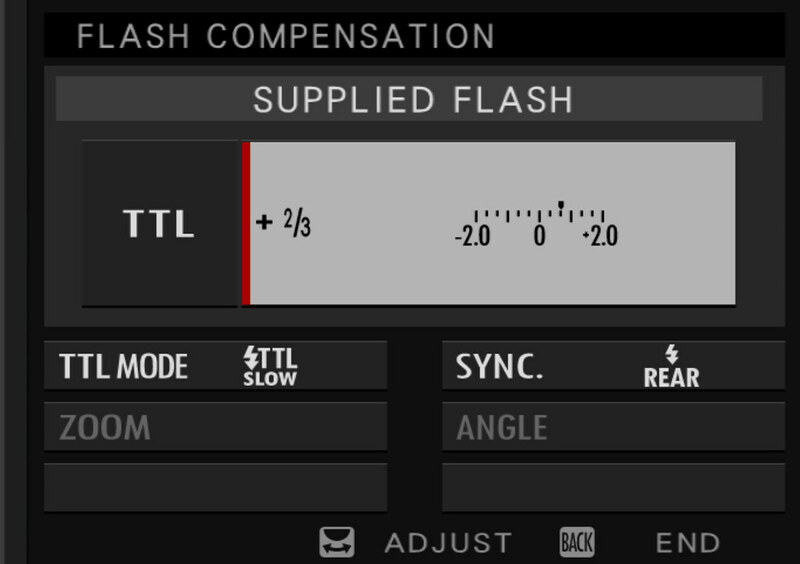 It’s now also possible to use the Slow Sync TTL setting in concert with rear curtain sync. That said, the full potential of the new flash system is only revealed when used in concert with one or more EF-X500 units. In concert with the new EF-X500, the TTL flash exposure compensation is comprised of a whopping ± 5 EV. In addition to the usual front and rear sync options, there’s also an FP option for high-speed sync (HSS) up to 1/8000s. The zoom reflector can either auto-adjust or be manually set to 16, 18, 23, 33, 46, 53, 56, 59, or 69mm positions, and you can pick one of three illumination angles (normal, narrow, wide) for each zoom setting. The additional LED of the EF-X500 can also be controlled in-camera. You can configure the LED light as an AF assist lamp, a direct catchlight (when the main reflector is bounced from the ceiling), or both. In manual flash mode, the light emission of the EF-X500 can be fine-tuned in 1/3 EV steps between 1/1 and 1/512 of full power. Besides the usual modes for TTL and manual flash exposure, there’s also a new MULTI mode for stroboscope effects. MULTI mode emits flash bursts of up to 100 exposures with a frequency between 1 and 500 Hz. To experience the full capability of the new flash system, use multiple EF-X500 devices in a wireless configuration with up to three independent groups. 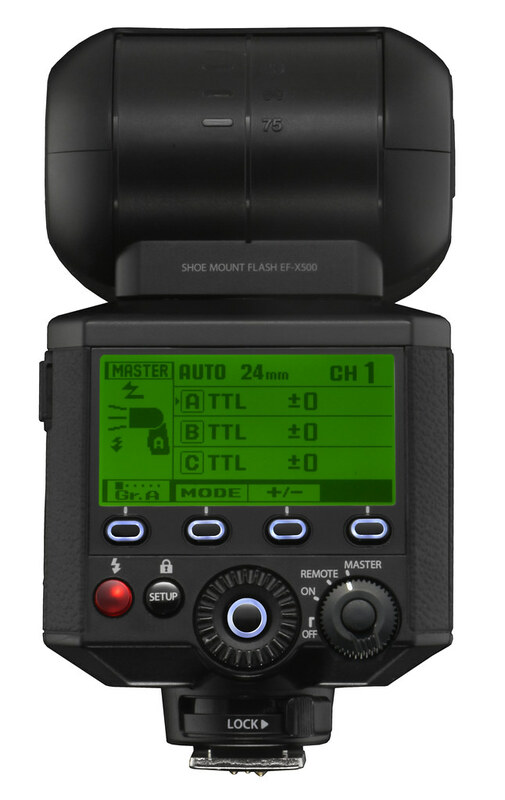 In Master/Slave mode, firmware 2.00 can control several EF-X500 flash guns in up to three independent groups, using either TTL flash, manual flash, or MULTI flash. Sadly, the communication between different flash units relies on old-fashioned light signals instead of radio. This illustration shows flash group A using classic TTL exposure, while group B is exposing with a preset fraction of whatever group A is exposing. This means that changing the power output of group A automatically adjusts the output of group B with the preset ratio, in this case 1.4:1. In this example, group C is under full manual control and is independent of groups A and B. The master flash (which is mounted on the camera) can either be used as a control unit or be a part of one of the groups. In our example, the master flash is assigned to group A. To avoid interference with other photographers, you can pick one of four communication channels for your flash devices. As far as the firmware is concerned, the new flash system in the X-Pro2 is flexible, state of the art, and powerful. Its weakness is the hardware: currently, the only flash that can fully exploit the new features is the EF-X500, which is large and expensive, and uses outdated light communication. There’s also no affordable wireless commander unit to control remote EF-X500 flash units. Instead, you have to use another large and expensive EF-X500 as a wireless commander. With the new TTL-Lock function, you can lock the power of your TTL flash in order to perform multiple flash shots with the same light emission. TTL-Lock works similar to AE-L; it helps you illuminate a scene for multiple shots with a defined amount of light, so it isn’t influenced by changes in the scene or in your composition. TTL-Lock can only be used by assigning it to an Fn button. 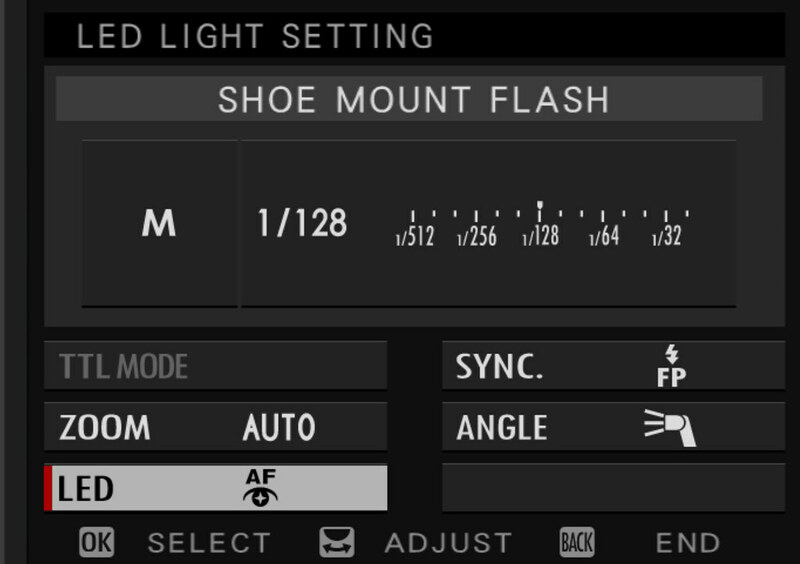 In the flash menu, you can choose between two options: either lock the flash power of your most recent TTL flash trigger (LOCK WITH LAST FLASH), or fire a metering flash when TTL-Lock is pressed, then lock the metered result for upcoming shots (FLASH SETTING > TTL-LOCK MODE > LOCK WITH METERING FLASH). 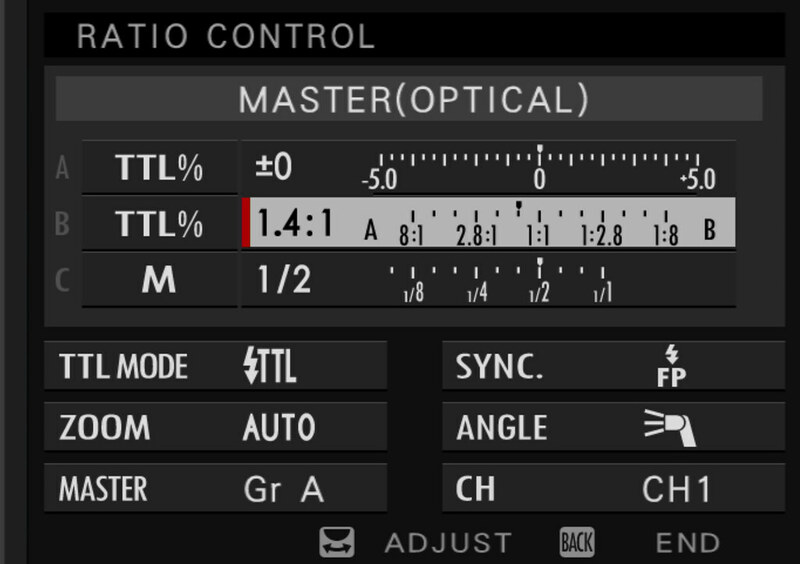 Even though the PDF manual for firmware 2.00 states the opposite, TTL-Lock can be used in concert with red-eye correction. The latter is only available in TTL mode, not in manual flash mode (again, the manual states something different). Another flash function that is only available via Fn buttons is MODELING FLASH. With it, you can use the EF-X500 like a studio setup light to simulate the effect of your flash setting. You can read more about Fuji X flash photography in chapter 2.7 of The Fujifilm X-Pro2: 115 X-Pert Tips. The various tips, explanations and recommendations in this chapter are still valid. Firmware 2.00 simply adds new features and changes the user interface of legacy functions. Since the X-Pro2’s battery doesn’t last very long, firmware 2.00 offers additional power saving options. SET UP > POWER MANAGEMENT > AUTO POWER SAVE > ON will reduce the frame rate of the live view display after approximately 10 seconds of user inactivity. As soon as you press any button or turn a dial, the frame rate goes back to its previous setting. Improved energy saving is also possible by automatically turning off the camera sooner than before. That’s why the AUTO POWER OFF function now offers additional options for 1 MIN, 30 SEC, and even 15 SEC. The remaining power management functions stay as they were, and you can combine the recommended High Performance Mode with the new Auto Power Save function. This is not contradictory, since High Performance Mode affects the camera when it is actively in use, whereas Auto Power Save is only applied when the camera is idling. Firmware 2.00 also brings a few ergonomic changes. For example, there is now an S.S. OPERATION menu item in SET UP > BUTTON/DIAL SETTING. If you set it to OFF, it won’t be possible to fine-tune or adjust shutter speeds with the command dial in 1/3 EV steps. Weirdly, this option also affects the shutter dial’s T setting, which becomes useless when S.S. OPERATION is set to OFF. Another change affects the behavior of the OVF bright frame when a lens is zoomed in or out. Also, remote connections with the Camera Remote App are now supposed to be more reliable. Last but not least, the automatic change of the OVF magnification (depending on which lens has been attached) should now work without problems. There’s also a fix for users of adapted lenses: the exposure issue related to Multi metering (described in tip 109) has been resolved. Rico Pfirstinger studied communications and has been working as journalist, publicist, and photographer since the mid-80s. He has written a number of books on topics as diverse as Adobe PageMaker and sled dogs, and produced a beautiful book of photographs titled Huskies in Action (German version). He has spent time working as the head of a department with the German Publishing Company Burda and served as chief editor for a winter sports website. After eight years as a freelance film critic and entertainment writer in Los Angeles, Rico now lives in Germany and devotes his time to digital photography and compact camera systems. His camera books are available at Rocky Nook and dpunkt Verlag.